Breast Thermography is a digital, infrared photograph of heat given off by your breast. Some breast cancers grow blood vessels (angioneogenesis), and these vessels give off heat. Thermograms can increase your chances of detecting early stages of breast cancer by several years when combined with breast self-examination, doctor examination and mammography. Dr. Jordan received her certification as a Board Qualified Thermographer in 2007 with﻿ Dr. William Cockburn and has successfully performed more than 400 breast thermograms over the last 7 years. She continues to study with thermography pioneer Dr. George Chapman. 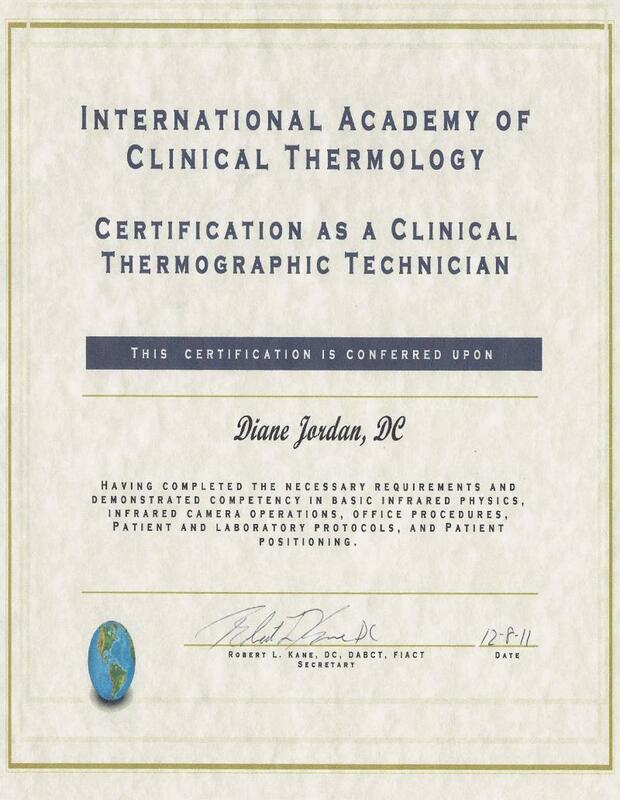 Dr. Jordan's assistant is a Certified Thermographic Technician. She has been working for Dr. Jordan for four years as a CTT. It is highly recommended that only certified technicians take your thermographic pictures to get t﻿﻿﻿﻿he most acurate thermographic image possible. Thermography is the only breast screening available for women ages 25-39. Thermography is safe for people with implants and for pregnant women. Thermography is safe for women with fibroids and dense breasts. Breast thermography has been FDA approved since 1982 as an adjunct to mammography. Who should have breast thermography ? Women and men can benefit from breast thermography screening. Younger women in their 30's and 40's with a family member with breast cancer are particularly benefited by breast thermography. In a private room you will disrobe from the waist up and after a 15 minute acclimation time, 6 pictures will be taken of your breasts. This takes another 5 to 10 minutes. The images will then be interpreted by a physician who is Board Certified in Thermal Imaging and the report will be sent to you. Please remember that thermography examinations do not diagnose cancer or any other pathology but shows early signs of potential problems, including infection, inflammation, scar tissue and cancer. Thermography does not replace self exams or doctor exams or mammography. Please ask your health care practioner what is best for you personally. All images are taken on our CTI Thermographic Camera with a 510K medical device clearance from the FDA. In addition to that our camera has the highest optical imaging of all thermographic cameras and is calibrated to within one onethousandth of one degree for the highest available level of accuracy. Copyright 2010 Diane M Jordan DC. All rights reserved.